Hello lovelies! I hope you're all having a fine day... and if you're not, well, let's add some color in your life by viewing swatches of these NYX Ultra Pearl Mania pigments I recently got. 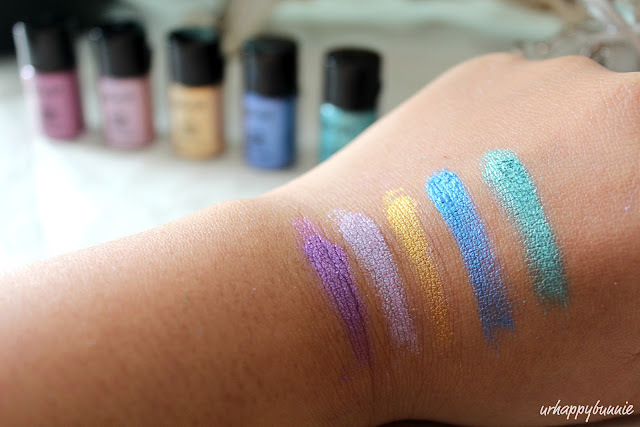 I had a few requests from some readers that they want to see swatches of the pigments. Happily indulging the ladies, here are the swatches of the five NYX Ultra Pearl Mania that I have: Purple, Lilac, Yellow Gold, Space Pearl and Turquoise. I absolutely love how vibrant they are on top of MAC Fix + (yes, I did spray on Fix + before applying them to the back of my hand). i sooo gonna buy them! Nice swatches Space Pearl and Turquoise look awesome pretty good pigment for NYX! Wow these are so pretty and pigmented! THanks for sharing these swatches. Suuuuuperrr!!! I'm totally fan of Nyx.. These colours are perfect for the Spring. The colors are so shiny and metallic, perfect for spring! Wow they are gorgeous! I always walk by them in ulta! Now I might have to purchase one! !